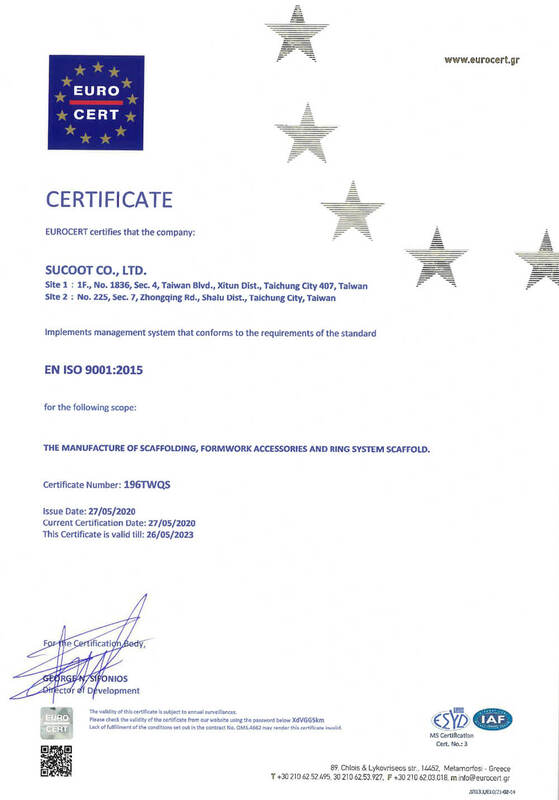 SUCOOT CO., LTD. was set up in 1984 and specializes in industrial scaffolding accessories and formwork parts. Today we have customers spreading over 65 countries around the world. Our industrial scaffolding products are engineered for safety, strength and flexibility to meet international standards within this industrial scaffolding industry, which are important for structural engineers, scaffolding factories and formwork specialists. In terms of working processes, we have expertise in iron casting, steel forging and thread rolling. 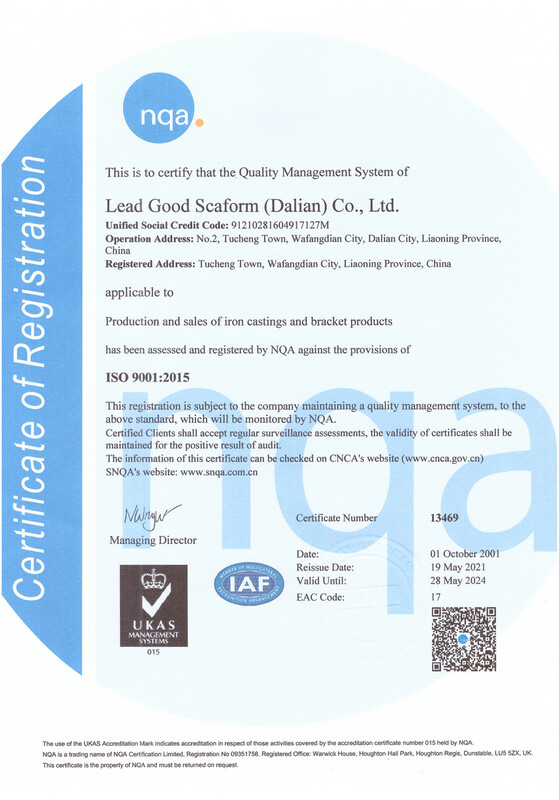 We are confident that our quality is on par with other world-leading brands. Especially our Ring System Scaffold, it has been widely used in many civil engineering projects, such as High Speed rail, Freeway, elevated railway, subway, high-tech factories, and music concert, and event application? etc. 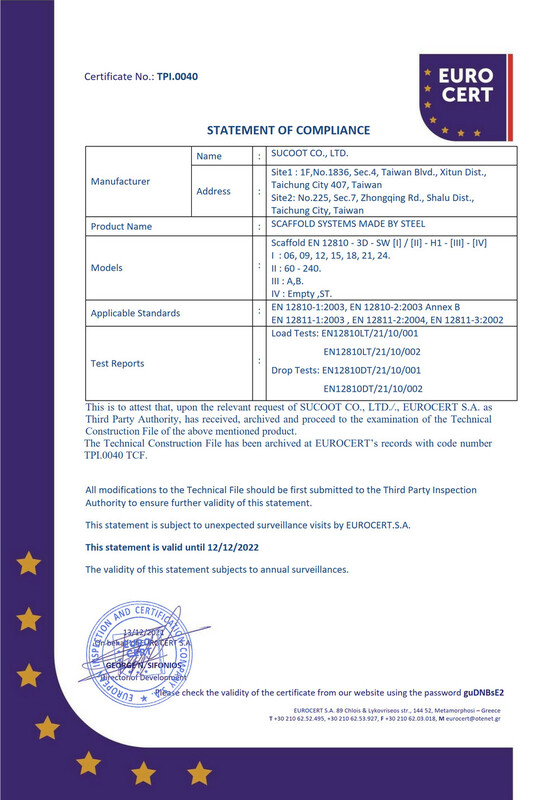 Moreover, We have exported our system to Thailand, Singapore, Philippines, Malaysia, Dubai, Israel, South Africa, Spain, Viet Nam, Indonesia, Russia, and Colombia. We successfully make use of our experience and the techniques into their local civil engineering projects. In 2008, we developed a lighter Ring System for facade application use such as petrochemical, energy, manufacturing and wall refurbishment. It has gained many great reviews from clients and end users. We were also honor to have the chance in association with Oscar best director, Ang Lee, assisting to create the movie scene with our Ring System Scaffold. With our technical knowledge, ready-to-ship inventory and full-service solution, we are able to serve customers with confidence and enthusiasm. Any enquiry shall be welcomed. Please contact us for more details. 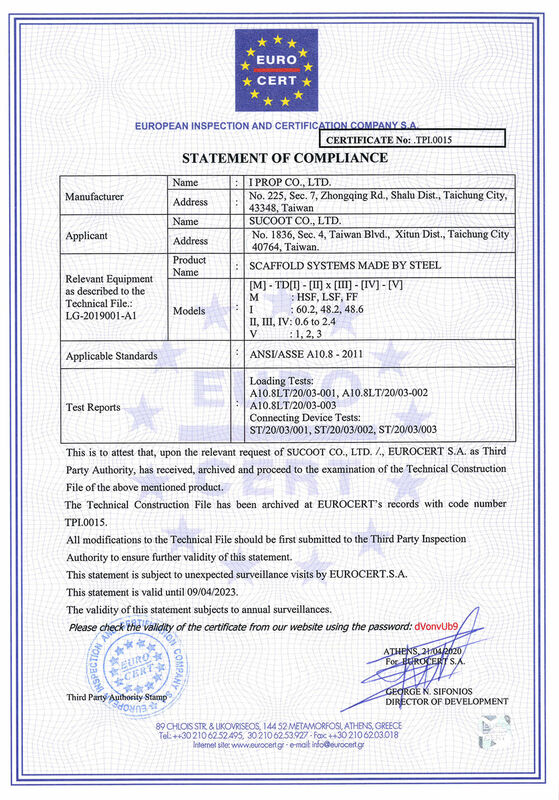 We are known as the first and the only company in Taiwan to obtain EN-12810-1. High-quality services to customers come from our professional team. 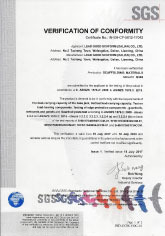 We assure customers of operational manual and warranty. I accept to receive the latest news from SUCOOT.